Get more ranch in your life with Bacon-Ranch Cheeseburgers. 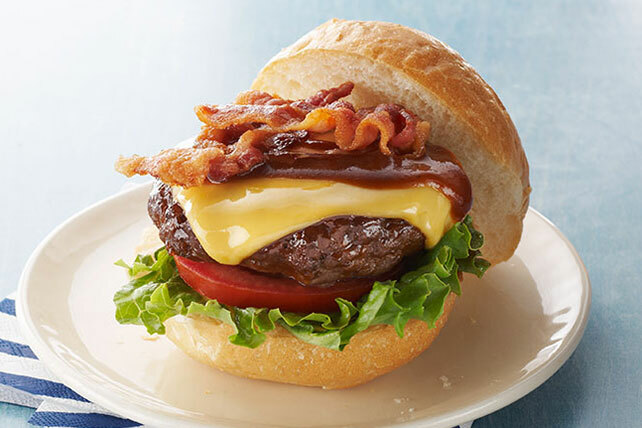 Burgers are yummy before adding to them; Bacon-Ranch Cheeseburgers are way more than delicious. Cook patties in skillet on medium heat 5 to 6 min. on each side or until done (160°F). Top with cheese; cover. Cook 1 min. or until cheese begins to melt. Fill rolls with cheeseburgers and remaining ingredients. Serve this main dish with a mixed green salad for a quick-and-tasty weekday meal!